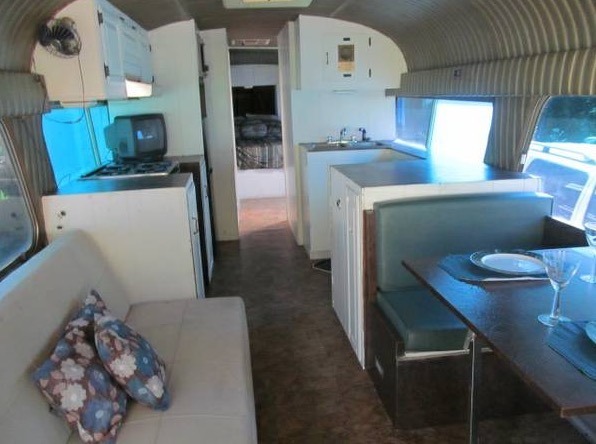 This is a 1964 GMC bus to motorhome conversion for sale near Boston, Massachusetts. Inside you’ll find a full kitchen, bathroom, sofa bed, dinette, and a bedroom. Asking price is $7,999 but the bus needs work. Please enjoy, learn more, and re-share below. Thank you! – Destination Reel ( lots of Destinations listed, mostly Raceways) They still make the heat resistant paper needed for this reel. You can make up your own reel with your own destinations / Name the Bus. – Laundry/or/ Trash Shoot, We used it for dirty Laundry. – Spare Parts, including Glass, starter, air bags, alternator, window seals, etc. Needs a new Hot Water Heater, new seals in front side window & middle side window. After using this Bus for the past 5+ years, we’ve noticed the wooden floor under the kitchen has gotten squishy, and the wood on the inside passenger side (near door) has rotted due to a leak in window seals. Also the window in the back drivers side has a seal that needs to be replaced. We still would have camped in it this year if we hadn’t moved on to a fifth wheel and maybe more. You can share this GMC motorhome with your friends and family for free using the e-mail and social media re-share buttons below. Thanks. If you enjoyed this bus to motorhome conversion you’ll absolutely LOVE our Free Daily Tiny House Newsletter with even more! Thank you! This is perfect for the people on this site who are really interested in tiny but have limited resources. Has everything you need with a few repairs you can make over time. Hope they see this one! Save a ton of counter space by just getting a flat screen. Whoever gets this is prob getting a great deal even if they just park it and fix what is stated here to be known to be wrong; but a really careful inspection of ALL systems and FLOORS and SEALS should be done to make sure what exactly needs to be done ASAP and or can be done later on. Seals leaking is a some what “Big Deal” problem as it lets water down behind the wall boards that can rot the floor; damage the wiring; rust the actual support chassis; and grow mold. I feel their is more to this gentlemen’s story than meets the eye, not my cup of tea but it doesn’t scare me. What kind of scares me is thinking a cute little tiny house will some how save our children’s future, we are giving them an 18 trillion dollar bill that is scary. we R very interested in your bus! It sounds like something we can handle. We R both on disability. Eddie fell 30 feet down an elevator shaft at the end of his day. He barely walked away with empty pockets and a broken back. This converted PD-4106 has been sold. It now resides in Pennsylvania, and its new owners are in the process of refurbishing it. They plan to utilize it as a motorhome and guest house.